The European Club Nintendo Stars Catalogue gets just received two new rewards, but they probably won't be around for long. 7,500 Stars gets you a replica of Game & Watch: Ball, the very first Game & Watch game ever produced all the way back in 1980. It's already been offered to Japanese and North American Club Nintendo members, so it's nice to see Europeans getting a shot at it too. Slightly less expensive is Game & Watch Collection, a steal at just 5,000 Stars. This DS game includes three Game & Watch games: Oil Panic, Donkey Kong and Green House from back in 1982. Will you be picking up a replica of Nintendo gaming history? I have G & W Ball, and I was quite surprised how good of a reproduction it really is. I try not think how much money I spent on games to get it. why is the coolest stuff always so damn pricey. I hate how stars are worth pretty much nothing. You need to buy a lot of games to get only a small amount of stars, and all the cool stuff costs a tonne of stars... Honestly, I've bought many games and my total amount of stars ever gained is 11000 something. That's still a long way off from that Zelda statue. I would rather get the SNES Classic Controller. Maybe now will get the snes controller or soundtracks. Woohoo, just bought the Game & Watch. Now to scratch off some more Club Nintendo vouchers when I get home to buy the Game & Watch game for the DS if it's still there later this evening. @ woodlin37 - for 4000 stars you can get the Golden Wii Wheel - great if you already have the Zelda gold Wiimote and the Goldeneye classic contolller. All I need now is a gold Nunchuck! I have 700 and they think that some "Tiny badge" only 1 or 2 will cost 3000 will be worth it, I can even get the same one but for cheaper in a store. Bah, I've only got 5000...so do I spend those on the Game & Watch Collection DS cart, or do I hold out for more stars, hoping that Ball will still be available in a couple of months time? 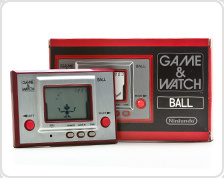 On the Game & Watch Collection: I'd rather have these games Game & Watch Gallery style.